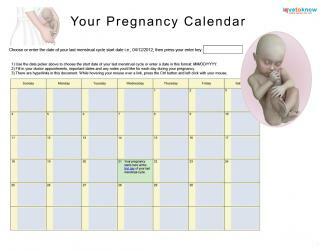 Now 23 weeks into your pregnancy, you're continuing to gain weight, and so is your baby. This is a great time to begin planning your maternity leave and how you'll handle life with a little one around. Having a solid plan can take some of the anxiety out of this exciting time. Your baby now has rapid eye movement (REM) during some periods. This type of sleep is very important for brain development and will continue throughout your child's life. His skin has changed slightly. It's now easier to see through the skin, and the skin is taking on a pinkish tone due to the blood vessels visible through it. Your little one's unique fingerprints have formed this week. Your baby's lanugo is becoming darker and more visible. It is possible for your baby to survive if born this week; however, he or she would require intensive medical care. Your uterus is continuing to grow this week, and the top of it now reaches about an inch and a half above your navel according to the American Pregnancy Association. By this point in the pregnancy, most women have gained between 12 and 15 pounds, but there is some variation. Talk to your doctor or midwife if you're concerned you are gaining too much or too little weight. Because your uterus has expanded so much, it's continuing to place pressure on your bladder. You've probably already noticed that you need to run to the bathroom a bit more often, but some women also experience urine leakage during this stage in their pregnancies. If you notice that you've been leaking clear fluid, it's important to determine whether it is urine or amniotic fluid. They can look similar, but amniotic fluid should not have an odor. If you are in doubt about whether the fluid is urine or amniotic fluid, contact your healthcare provider immediately. You may also notice that you're more forgetful than you used to be. Sometimes called "baby brain" or "pregnancy brain," this spaciness is due to hormones. If possible, try to go easy on yourself for this forgetfulness. You'll be back to your normal sharp self after the baby is born. Having a baby can bring up a lot of questions, especially when it comes to employment and childcare. Planning for your baby's arrival can help reduce your feelings of anxiety. If you're working outside of the home, now is an excellent time to finalize your plans for your maternity leave. Under the Family and Medical Leave Act (FMLA), many employers in the United States are legally obligated to give employees 12 weeks of unpaid leave after the birth of a child. This applies to both men and women. While many women stop working during the seventh or eighth month of pregnancy, others work until their deliveries. Unless you develop complications that require bed rest or your healthcare provider says otherwise, there is no medical reason why you can't work until the end of your pregnancy. However, it's important to realize that your baby may arrive early. For this reason, preparing for your maternity leave as soon as possible is a smart decision. As you're discussing your plans for maternity leave, remember to speak with both your supervisor and human resources department manager. Clearly communicating your plans will ensure a smoother transition. Not all families have the option of one parent staying home with the kids, and many women choose to continue working after their maternity leave. It's important to discuss your plans as a family so you can start lining up childcare if necessary. Many daycares have long waiting lists, so this is a good time to visit day care centers and home day cares to find one you and your significant other like. Your baby has been growing at a steady rate all through your pregnancy, but he or she is about to start gaining fast. In the next six weeks, your little one will double in size. Keep eating well and taking care of yourself to help your baby grow.